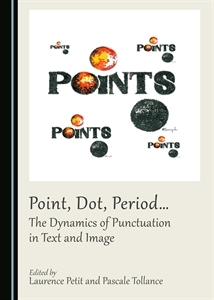 Point, Dot, Period… The Dynamics of Punctuation in Text and Image is a collection of twelve previously unpublished essays which explore the fundamental role played by punctuation in the two semiotic fields of text and image. Whilst drawing upon a wide range of material, including painting, engraving, photography, video art, poetry, fiction, and journalism, each essay contributes to the exploration of singular uses of punctuation which highlight the complexity of what remains in all cases a silent, and yet particularly eloquent, mode of expression. By bringing together authors from a variety of fields, such as linguistics, literary studies, and art criticism, at a time when the relation between text and image occupies a prominent place in the critical landscape, this volume offers new insights into the possibility and nature of their encounter, and invites the reader to focus on the material aspect of visual and textual creation. This collection also offers an original approach to the works of some major artists and canonical authors, whilst simultaneously making room for emerging talents.